Many believe that honey bees originated in Southeast Asia and spread to Europe and Africa. Now, because the western honey bee has been domesticated to produce honey for humans, they have been transported all over the world. There were no honey bees in North or South America until brought here by colonists. Honey bees naturally nest in tree cavities or other suitable sites and forage in forests and fields where flowering plants are abundant. The use of a cavity for nesting is an important adaptation because it provides protection from both predators and the environment. However, as cities continue to grow and land is used increasingly for agriculture or other purposes, bees’ natural habitats are dwindling. Habitat destruction is a possible reason for the recent decline in both native bee species and honey bees. It may also be a contributing factor to the onset of Colony Collapse Disorder. The search for suitable nesting sites becomes more difficult and interactions with people could increase as honey bees seek out nesting sites in buildings or other human structures. Most bees are adapted to eat nectar and pollen. 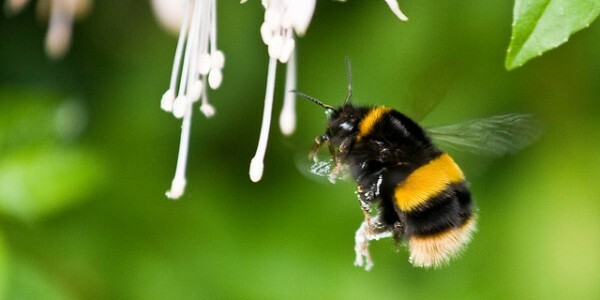 Nectar is the primary energy source for adult bees because of its high sugar content. Pollen is the major source of proteins and other nutrients required by both adult and larval honey bees. Nurse bees consume pollen to produce the glandular secretion fed to the young larvae. Honey bees modify nectar to produce honey. The process involves the addition of enzymes to break down some of the complex sugars and the evaporation of water to create a more concentrated solution. Honey bees store large amounts of honey because it is their food source when they overwinter and are unable to forage. All larvae are fed a substance called worker jelly when they’re developing until they’re switched to a diet that also contains pollen. Larvae that are destined to be queen bees are fed large amounts of royal jelly, which determines their development into queen bees instead of worker bees. Bees have a strong symbiotic relationship with flowering plants. Plants provide food to bees and bees help with plant reproduction. People also cultivate flowering plants for both aesthetic and agricultural purposes. Keeping garden plants and crops alive and thriving can mean using pesticides. Adherence to all pesticide labels and proper procedures is necessary to prevent affecting beneficial insects. Improper use could lead to bees and other pollinators being harmed when they are out foraging for nectar and pollen. Pollinators make the world more beautiful with blooming plants and flowers, and work hard to pollinate crops that provide food for our country. Learn what you can do to help protect the pollinators in your community. For more information, view the USDA preliminary report on honey bee health here. © 2019 National Pest Management Association.